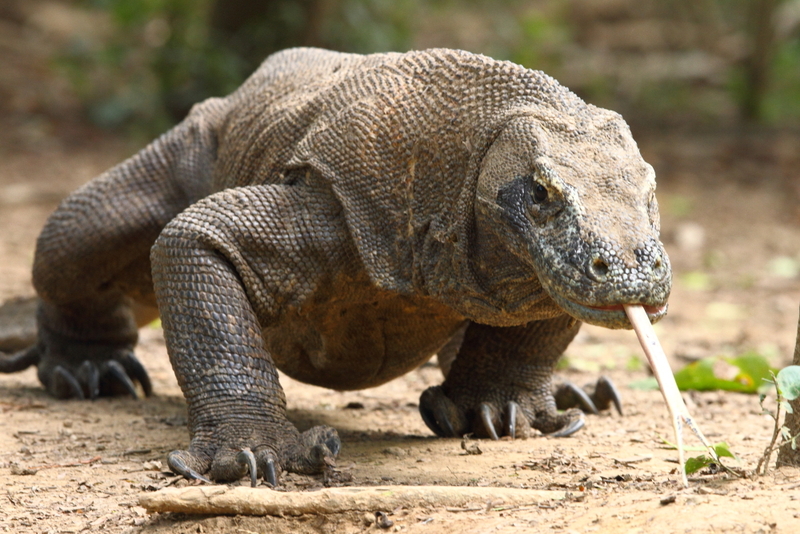 Today I want to write about a very cool and dangerous reptile, the Komodo dragon. The largest lizard in the world, Komodo dragons can grow up to 2 metres long and weigh up to 90 kg. Males are much bigger than females. They ambush large prey such as buffalo, deer and wild pigs, delivering an extremely venomous bite that stops the blood from clotting. It can take a few days for the victim to die from their wounds so the Komodo dragons follow them until they can be eaten. They can eat up to 80% of their body weight in one meal, using their powerful jaws to tear off flesh. They have an excellent sense of smell through their long yellow tongue and can detect carrion from almost 10 km away. They lay about 20 eggs per clutch and young Komodo dragons are often eaten by adults, so they spend most of their early years in the safety of trees. Zoos have recently discovered that females are able to lay eggs without needing a male to fertilise them. All of the babies that hatch from these eggs end up being males. This is a very rare process that has only been recorded in a few vertebrates. They are found in open grassland and in forests on only three Indonesian islands, Komodo, Rinca and Flores. There are only about 4,000-5,000 animals left and they are considered vulnerable to extinction. Are there any other interesting facts that you would like to share about Komodo dragons?